Content Creator, Horror Writer, Film Critic. His author blog is at ThinkingSkull.com. Meticulous attention to setting, characters who inspire sympathy and dark attraction, and a unique ability to reinvigorate classic horror tropes. After creating MovieCrypt.com in the late 1990s, he honed his narrative voice on film critique and became a member of the Online Film Critics Society. He also portrays the site’s host, Grim D. Reaper, both on the site and at fan conventions. 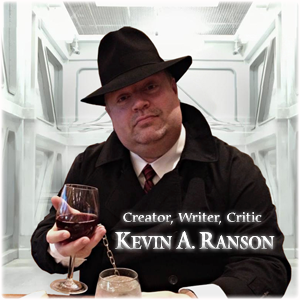 In addition to his role-playing game contributions, Kevin published the first book in The Spooky Chronicles series in 2011 and The Matriarch with WTF Books in 2013. He is also an active member of The Horror Society. Possessing considerable knowledge in genre film and television, Kevin has become a frequent panel guest for fan conventions and hosts his “Ultimate Occult Showdown” (a one-hour impromptu game-show panel where the audience must participate and there are no prizes) with his copyeditor and fellow “opinionated a**hole,” Brett J. Link. Kevin currently resides in the Houston, Texas area with his wife and fellow horror author Linda S. Cowden, four dogs, three horses, and at least a dozen cats (don’t judge). Am I really Kevin A. Ranson? Find out for sure over at Officially Plugged In and see for yourself.